It's Tabata Tuesday!! What is tabata, you ask? Tabata training originated in Japan where a group of researchers analysed the difference between moderate (70% max effort) and high-intensity (170% max effort) interval training. The athletes performing high intensity interval training improved their aerobic AND anaerobic systems. Whereas, the athletes performing moderate intensity interval training only improved their aerobic systems. Tabata is a form of cardiovascular exercise that produces similar (and often times, better) results than steady state cardio (like...hanging out on the elyptical for 60 minutes). So if you could get the same results from a few minutes of high-intensity training as you would with an hour or two cruising along on the treadmill, which would you choose? No brainer, right!? Tabata wins. Total, it's a 4 minute workout. Say whaaaaat!? yep. and it works. Today, I'm challenging you with a great Tabata workout. 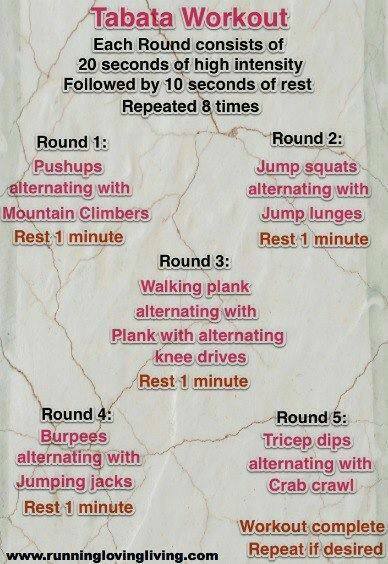 You can choose any variety of exercises, however, this workout alternates arms, legs and core. When I ran through this workout this morning I followed it up with a 2 mile run. Our bodies respond to interval training BEST when followed by a period (10-15 minutes) of steady-state cardio. Think of a car - you burn through more fuel when you stop. start. stop. start. stop. gun it. stop. start...get the idea? Your body works the same way. You burn more calories when you cause your heart rate to jump (ergo, intervals)! Give it a try and tell me what you think! !